Some services, for example unfuddle.com have a neat feature where they can automatically back everything up to an S3 bucket in case of issues. This morning unfuddle went down for a while, so when it came back up I thought it would be a good idea to finally set this up. Unfuddle asks for the 'access key id' and 'secret access key' in order that their scripts can write direct to your bucket. This is great, but armed with both those keys an attacker can easily access ALL of the buckets associated with that account. Our main account has potentially sensitive data in some of the buckets, so there is obviously no way we'd share the keys to that account with anyone. Instead, what we can do is to create a completely new AWS account, and from the main account grant access to the new account ONLY to the bucket that'll contain the unfuddle backups. Note that you do not need a credit card number to do this, as the new account will not 'own' any of its own buckets. Also note that usage charges for the backup bucket will be applied to the main account. Here's how: (note this tutorial requires Cyberduck, a free S3 and FTP client). Make a new email address such as aws-myproject@example.com. In the passwords file, record the email you used, and the 'access key ID' and 'secret access key'. Log in to your main AWS account using Cyberduck. Click the cog icon, then Amazon Customer Email address. Your user now has read and write access to the myproject.example.com bucket. 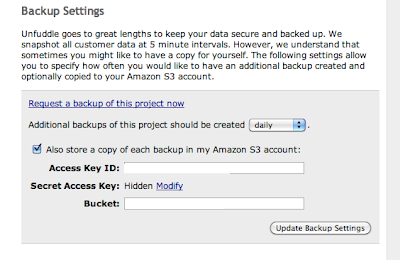 Now you can go to Unfuddle project settings, and enter the backup bucket name, 'access key ID' and 'secret access key' associated with the aws-myproject@example.com account. Even if those details are ever compromised, an attacker will only be able to access the single bucket you set up. This tutorial assumes unfuddle, but will work for any third-party cloud service that wants to read or write to S3 buckets. Thanks to Tom & Richard of Calvium for the idea, and for their help setting this up.